Beautiful mottled pink coats, the berlotti bean feels smooth and special to uncover, feels almost a shame to boil them as they loose their elegant pretty print. They are plump, creamy and substantial, the perfect staple for this season to compliment your dishes. Nostalgic memories bring back Tuscan summer nights and having them crushed with plenty of extra virgin olive oil, garlic, parsley and rosemary on a bruschetta- actually for me that is the taste of carefree summers in Tuscany as a small child. The rive café in Hammersmith always does the bean justice- Ruthie Rogers and the late Rose Grey understood the simplicity and magic to Italian food- letting something like a modest berlotti speak for itself, without being ruined with too many flavors. 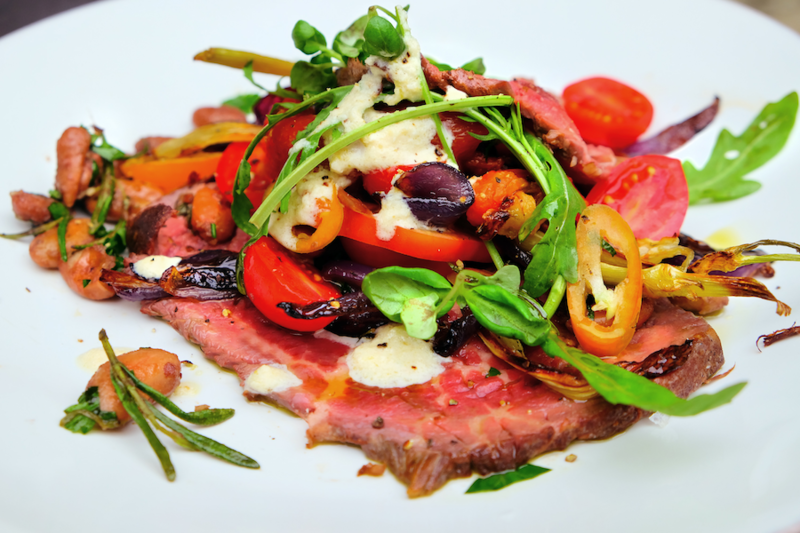 So we took our favorite bean and turned it into our kind of hearty salad using fillet of beef, the sweetest of tomatoes, roasted fennel and red onions and a tasty horseradish cream fraiche. This is always a very exciting outcome when you find yourself getting creative and putting a salad together- we will now be making this at our own summer dinner parties. The flavors are all so delicious together, complementary and visually very pleasing. When it comes to visual inspiration Skye Gyngell’s wonderful cookbooks are always first on the pick for us, our favorite being A Year In My Kitchen - she is successful in managing to make everything look elegant but also mouth watering at the same time- which can be quite a challenge. what could be more perfect then tomatoes and berlotti beans at this time of year, doused in olive oil and sea salt- perfection. We wanted to make a summery lunch this week that would feel both delicious and spoiling. We combined some of our favorite summer flavors with a seared fillet of beef. This is the ultimate hearty healthy flavorsome dish you need to whip up this week, extremely simple to make.